Details : 26" SEv. Tet. E-M Re Bl. 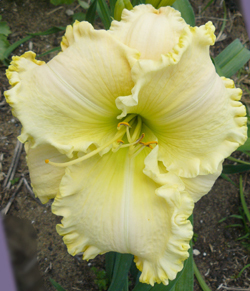 7"
A very large heavy substanced cream yellow with a green throat and heavily ruffled petal edges. Details : Ht 28" TET SEv. E Re. Bl 6"
Orange base colour with darker spiced orange eye and edge. Details : Ht 26" TET. Ev. Mid, Re. Bl 5"
Cherry magenta rose with gold ruffled edged petals. Yellow to chartreuse throat. Details : Ht 23" TET. Ev. E. Re. Bl 5.5"
Cream with a huge wine eye above a green throat. Limited stock. Details : 26" Ev. Tet. E-M. Re. Bloom 5"
A crimped maroon-brown with a deeper smudging eyezone above a rich gold throat. Rounded blooms with a sheen. Popular. Details : 22" Ev Tet. M Re. Bl 4.5"
A very pretty peachy-pink with a rose-raspberry eye and green-yellow throat. Ruffled petals that are edged in raspberry and gold. Rapid increaser, great performer. Details : 30" Ev. Dip. M Re. Bl 6.5" - 7"
Large re-curved bright rose blooms with white midribs and a huge yellow throat. Details : 34" Ev. Tet. E-M Re. 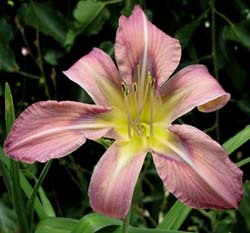 Bl 6"
Stunning magenta bloom with sometimes a paler eyezone and a crisp green throat that extends out into the petals. Triangular shaped and ruffled. Strong grower. Details : 30" Ev. Tet. E-M Re. Bl 6.3"
Large pretty pink lilac blooms with a bright rose tiangular eye. Large triangular yellow-green throat. Hardy and vigorous. Just spectacular in a clump. A favourite. Details : 32" Ev. Tet. E-M Re Bl 6.5"
Large tangerine blooms with a bright red burgundy eye. If you like them bright - this is a real show-off. A favourite. Blooms over a long period. Details : Ht 28" TET. SEv. E-M Re. Bl 6½"
Pale pink with a cream eyezone and green throat. Ruffled pale gold edge. Limited stock - 1 per customer. Details : Ht 26" Ev TET. E. Re.Bl 6.75"
Details : Ht 38" Tet. Med. Re. Bl 6"
Lovely deep orange with a dark deep red eye. Lovely ruffled form. Details : 26" SEv. Tet. M-L. Re. Bl 6"
Bright coral rose with a black purple eye and matching picotee edge. Details : 24" Ev. Dip. M-L Re. Bl 6"
A gorgeous ruffled peach pink with a yellow green throat. Great substance. Details : Ht 26" TET. SEV E-M Re. Bl 6"
Lavender pink self above a green throat with gold picotee edging. Limited stock - 1 per customer. Details : Ht 30" TET Ev. E-M Re. Bl 6"
Large ruffled creamy white with a thin gold edge. Limited stock. Large ruffled blooms of rich, clear voilet, purple with a green grass throat. Limited stock. Details : Ht 27" TET. Ev. M. Re. Bl 5.½"
A full rounded black purple bloom with a lime heart. Petals are beautifully ruffled. Limited stock 1 per customer. Details : 28" Ev. Tet. M. Re. Bl. 5.5"
Flaming orange which deepens into a ruby red eye and a deep golden throat. A real stand-out 3-4 way branching, many buds. Limited stock - 1 per customer. Details : Ht 28" TET. Fragrant Re. Bl 5.25"
Peach-almond with a dramatic burgundy eye and matching edge. (Flamingo Tart x Julie Banks). Details : 26" Ev. Dip M-L Re. Bl 6"
A feminine diamond dusted bloom of pale cream orchid with a pink-lavender band, lime green throat. Lovely soft ruffling. Details : 26" Ev. Tet. E-M. Re. Bl 4.25"
Medium - small flowering red with a distinctive dark red/black eye. The colour in the hot summer months can appear orange red with a dark red eye. Blooms are ruffled, recurved and rounded. Details : Ht 28" TET. EV EM Re. Bl 5"
Burnt orange with a plum eyezone and edge and a yellow-green throat. Limited stock - 1 per customer. Details : 28" SEv. Dip. M Re. Bl 5"
Pink with bright rose eye and a large green throat. Looks stunning in a clump. Details : 26" SEv. Tet. M-L. Re. Bl 5.5"
A near white rounded bloom with sometimes pink highlights and a heavy, tightly ruffled gold edge. Green throat. Limited stock. Details : 26" SEv. Tet. E-M Re. Bl 5.5"
An ivory cream with a very dramatic dark purple-black eye and picotee. Long bloomer and vigorous. Limited stock - 1 per customer. Details : Ht 26' TET Ev. Re. Bl 7"
Large rose purple blending to a soft lavender, with yellow edging. Blooms are accented with a soft pink watermark that smoothly blends into a large intensely bright green throat. Heavy substance. Gorgeous. Details : Ht 27" TET. SEv. M Re. Bl 6"
Intense purple with a white shark's tooth edge on petals and sepals. Limited stock - 1 per customer. Details : Ht 38" TET. Ev. M Re. Bl 7"
UFO Crispate. Burgundy purple spider variant with creamy violet plum purple eyezone above lime chartreuse throat. 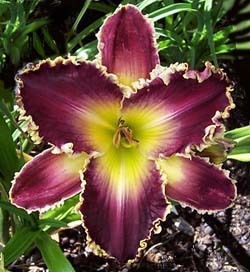 A medium mauve bloom with a striking purple eye and picotee edge. Lovely ruffled petals. Limited stock - 1 per customer. Details : Ht 26" TET Ev. E-M Re. Bl 6½"
Large stunning creamy salmon with a maroon red eye and matching ruffled, bubbly hooked edge with gilted gold edges. Robust and vigorous. Limited stock. Details : 21" SEv. Dip. E. Bloom 6.25"
A large rose-pink bitone with a darker rose halo and green centre. White midribs on very ruffled petals. Sepals are a paler rose pink. Interesting form and style. Details : Ht 28" TET. Mid Re. Bl 6"
Details : 25" Dor. Tet. E-M. Bl. 5.5"
Round and ruffled pretty baby pink with a multi-coloured patterned eye. Another image of M.R ion "Eyed & Fancy".